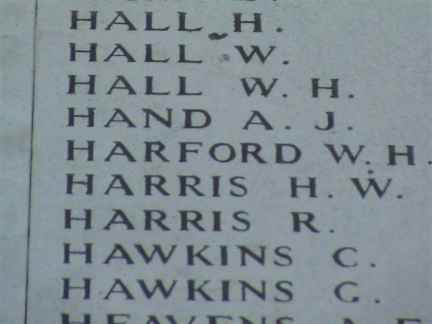 In loving memory of Pte Alfie Hand of the 2nd Wiltshire Regiment who was killed in action in Belgium October 24 1914. From his sorrowing Mother, Brother and Sisters. Hand. In loving memory of Pte Alfie Hand, 2nd Wiltshire Regiment who was killed at Brages, Belgium on October 24th 1914. We could not say Good bye. Ever remembered by his loving Mother, Brothers and Sisters.